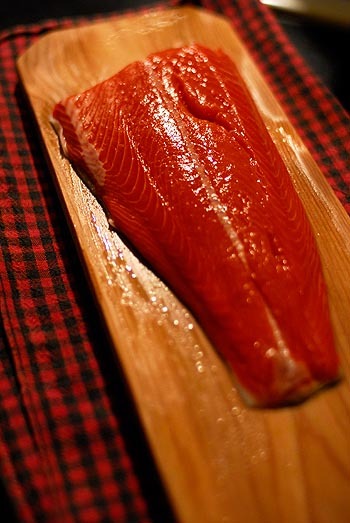 So this is what we did: we got ourselves a nice piece of wild-caught salmon, a decent bottle of white, and visions of a perfect fish on cedar. I thought of thyme in the garden and fresh lemons in the fridge. Rock salt from the Cambodian coast. A glug of olive oil. A pat of butter. Now, about that cedar: we could buy such an item here, in a single-use exclusive set of four, for $14.95. But we didn’t need four, and we had an alternative in mind. We bopped on over to the nearest hardware store and bought a 6-foot cedar picket, the kind you would use in a fence. It cost $1.97 ($2.12 with tax). When we got home, Jerry quickly disappeared into the tool shed. He sawed that picket to the perfect length for a piece of fish. He used a jigsaw to angle the edges, then sanded the whole thing. He even drilled a little hole into the top—just in case we decide to hang that plank on a wall. When he emerged from the shed 10 minutes later, we had the most beautiful little cedar plank for culinary purposes. We soaked it in water a while, then began our adventures in grilling. And it was the most fragrant salmon I’d ever eaten; entirely infused with the essence of cedar; perfectly mingled with the butter, oil, salt and thyme, and a bit of lemon squeezed on the end result. Can’t wait to put that picket to use again! I am in love with every single part of this post. That is what makes life beautiful. Sasha, great idea! I might have to start doing all of my kitchen shopping at the hardware store…. Vicki, I miss the prevalence of salmon in your (our old) neck of the woods. Fish, berries, wine and Oregon summers. Rowdy Chowgirl, I will definitely keep that in mind. Megan, it’s a key attribute to have in the kitchen.